We may grow up, move out and start families of our own, but there’s always a little part of us that misses Mom. The kiss on a scraped elbow, the hug after a heartbreak, the pride on her face. With Mother’s Day just around the corner, we at Zen Spa are excited to share our memories of Mom, and invite you to do the same. Around here, Monday is now known as ‘I Love Mom’ Monday! Visit our Facebook page and post your favorite pic including a caption of a special Mom moment. The following Friday we’ll pick our favorite to win our ‘I Love Mom’ package – a cleansing classic facial, 50-minute Swedish massage, a rose, sparkling cider and a box of chocolates. Be sure to post your pics on Monday April 20, April 27 and May 4. We’ll announce winners on April 24, May 1 and May 8. That’s three chances to win! To get the ball rolling, take a look at this sweet moment from store manager Holli. 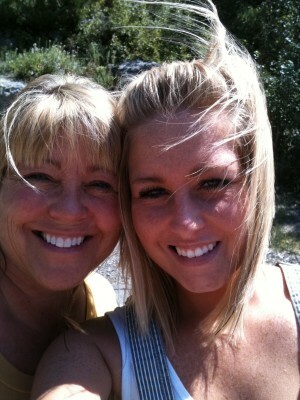 She and her mom recently spent the day together hiking along the American River. What’s your favorite ‘mom moment’? Don’t forget to show us on Monday…we can’t wait to see! Need a gift for Mom this year? Our ‘I Love Mom’ package is also available for purchase. Only $89.95!